In the wake of news that J. Michael Straczynski has bailed out of writing Superman and Wonder Woman due to the success of the Superman: Earth One graphic novel, I’ve decided to drop those books too. I mean, if he can’t commit to finishing the stories he started, why should I commit to finishing reading them? Honestly, though, his Superman was awful, just nonsensical and boring. Wonder Woman was better, but nothing I’m going to miss. And yes, I skipped Superman: Earth One, too, because, you know, another retelling of Superman’s early days? No thanks. Oh, and both Batman: The Return and the first issue of Batman Inc. shipped this week, but as I said last week I’ve pretty much gotten the idea where Grant Morrison’s Batman work at DC is concerned (quirky, yet dull and characterization-free), so I decided the end of The Return of Bruce Wayne was the end of it for me, and I passed on both those issues. Speaking of series I’m dropping, this is it for me and The Flash. Geoff Johns’ writing has been okay, but the title, “The Dastardly Death of the Rogues”, had very little to do with the actual story (only one “Rogue” died, and he wasn’t even the real deal), and the plot felt rather recycled (time travel, changing history, etc.). And as I’ve said before, I haven’t been at all convinced by Johns’ handling of Barry Allen returning to his old life and job after what must have been 5 or 10 years of time in Central City, with little questioning from his colleagues and friends as to where he’s been. The adventure has been a decent romp, but it didn’t really hang together. But the thing that’s really driving me away is Francis Manapul’s artwork, which is sketchy, simplistic, makes many of the characters look like teenagers, is short on backgrounds, and features some really bland layouts. His art has been getting rave reviews from some corners, which frankly astonishes me, but diff’rent strokes, I guess. It just hasn’t worked for me at all, and his name on a book will be a big caution sign for me in the future. Maybe down the road I’ll regret dropping this series so soon, as I did Johns’ previous resurrected hero’s series, Green Lantern. But at least that series had top-notch artwork, even if it got off to a slow start. There’s really nothing that appeals to me about this Flash series. 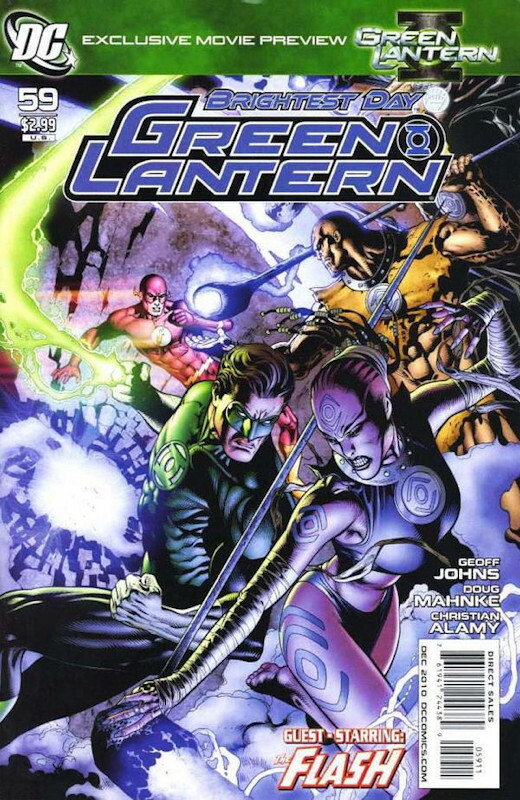 And speaking of Green Lantern that series is still dealing with Hal Jordan trying to hold together an alliance of the seven colored ring corps as they try to track down the seven avatars of the corps. 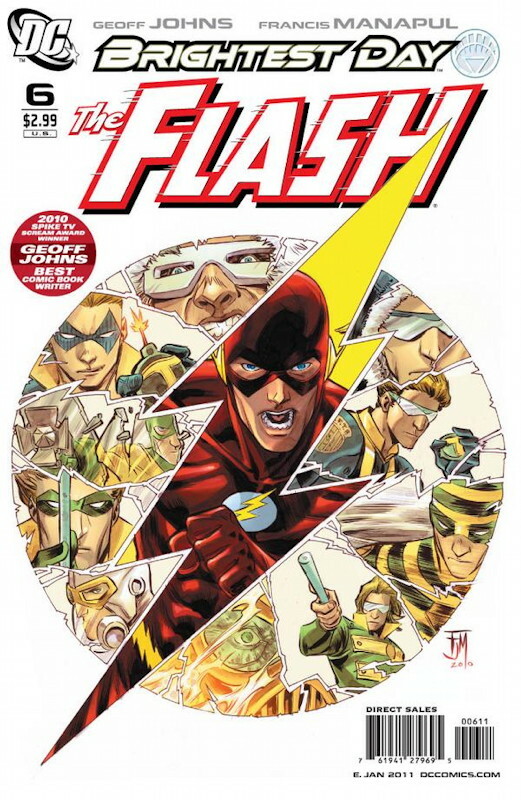 Since some of the corps are outright villains, this is a tough group to manage, and this issue focuses largely on Flash trying to talk some sense into GL that perhaps he should be turning to his earthbound friends – no slouches themselves in the power department – rather than the murderous Red Lanterns or the avaricious Larfleeze, the Orange Lantern. The problem with this story is that Flash is absolutely right, and the set-up smells strongly of Johns being just too in love with the idea of a rainbow lantern corps that he’s making GL behave out of character in order to keep the idea going. While an alliance between the Green (will) and Blue (hope) corps, and maybe even the Star Sapphires (love) makes some sense, working with Larfleeze or the Red Lanterns is borderline-insane. And frankly the fact that bad things happen at the end of this issue are the natural consequences of GL not listening to reason. It makes the story difficult to believe in. 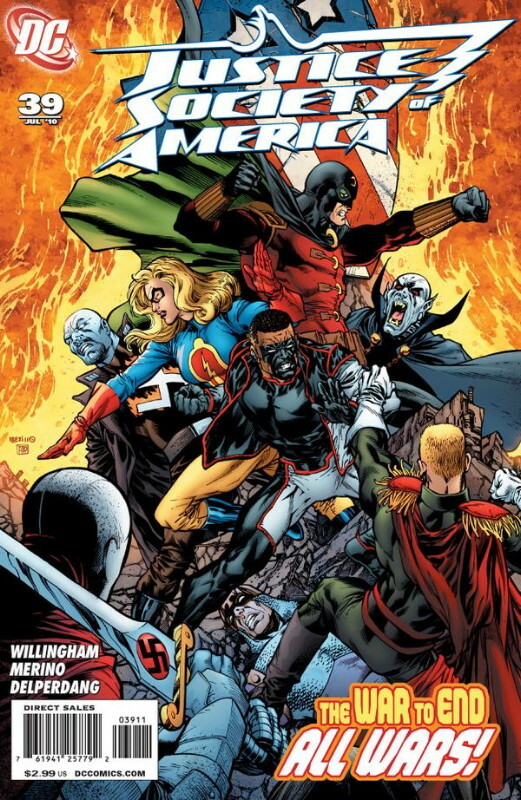 I think the premise is supposed to be that the Blackest Night changed the status quo among all the ring corps, but it doesn’t really hold up: Absent a clear-and-present danger (and the avatars don’t really present one), it’s hard to believe that these corps would work together and ignore their natural impulses. And at some point the series is going to have to deal with the presence of several thousand rings of each color flying around the galaxy, because otherwise it’s going to lead to everything being destroyed. Johns has raised the power level too high without really considering where that’s going to lead, and having it lead somewhere else makes the story less and less plausible. 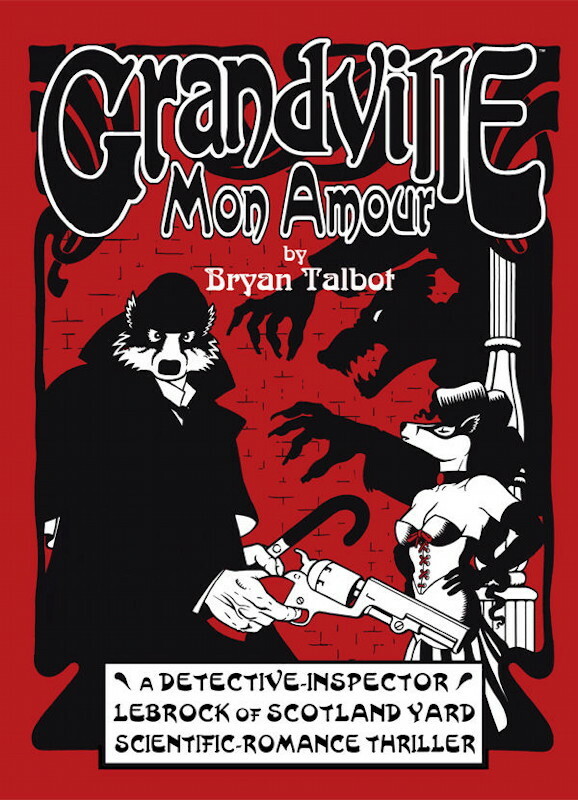 Let’s move on to some good stuff: Grandville: Mon Amour is (you guessed it) the sequel to Bryan Talbot’s anthropomorphic alternate-history scientific-romance thriller (whew!) that I read earlier this year. The setting is Britain and France in the present day, but a world where France conquered Europe under Napoleon, and Britain has only recently won its independence. Detective-Inspector LeBrock is one of Scotland Yard’s best investigators, and was recently involved in an escapade which resulted in the death of the French Emperor, as well as the death of a woman he loved. But he’s pulled out of his misery by the escape of “Mad Dog” Mastock, a former revolutionary who later became a deadly serial killer, whom LeBrock apprehended several years ago. Mastock escapes from prison on the day of his execution, and LeBrock is forced to resign from the Yard in order to pursue him. As before, LeBrock and his partner Detective Ratzi follow Mastock back to Grandville (which I believe is Paris) to find out what he’s up to and to bring him down. As in the first book, the case will change the course of nations. Oh yeah, and all the characters are human-sized animals: LeBrock is a badger, Ratzi’s a rat, and there are dogs, cats, rams, pigs, and various other creatures. Plus a few humans, who are a lower-class oddity in this world. Other than very muted undertones of racial differences, Talbot doesn’t really do much with the different species in the book, but it does make the work visually different. But I found it perfectly easy to ignore the anthropomorphic renderings and just enjoy the story for what it is. And it is a very good story, as Talbot – as he always does – has meticulously worked out the setting and characters of his story, and sumptuously renders every panel. It’s really a beautiful work (as was the first volume). The story is a page-turner, too, with a smashing climax (although there’s an extra layer of discoveries to be made at the end which I felt was a little too much, but it’s not a big deal). While I haven’t read everything Talbot has done, I’ve read a lot of it, and his writing and art have gotten consistently better with time. I hope he’s planning to continue doing Grandville volumes, because the first two have been great. If any of the elements I’ve described in the story appeal to you, I suggest you check it out. Two Oni comics stories wrap up this week. 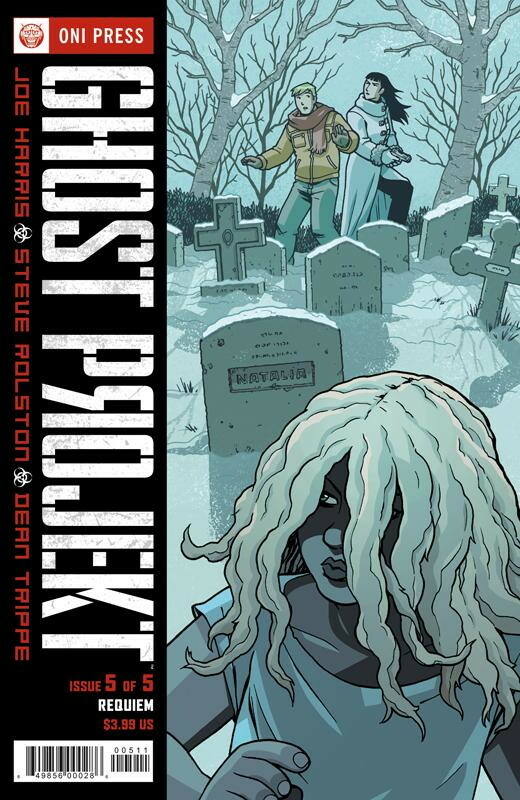 Ghost Projekt has been an excellent 5-issue miniseries about Will Haley, an American weapons inspector working in Russia, who teams up with with Anya Romanova, a Russian agent, to learn the secret of the Cold War Project Dosvidanya, whose former members have been turning up dead. It was a nifty combination of the post-Cold War Russian setting and a fantasy/horror plot. The payoff is pretty good, although there’s a development at the end involving Anya which I didn’t understand – I think I’ve forgotten a plot detail somewhere. I also appreciated that the story has a climax, and then several pages of denouement trying up loose ends – too many stories these days forget how important that part is. Steve Rolston‘s art is simple but extremely effective; his style feels like it comes from doing comic strips, but he does a great job drawing the darker stuff, too. It gives the story a cheerful veneer without compromising the seriousness of the story – it’s an approach you wouldn’t see much from one of the major publishers. I hope there will be a sequel series, because this was a lot of fun. 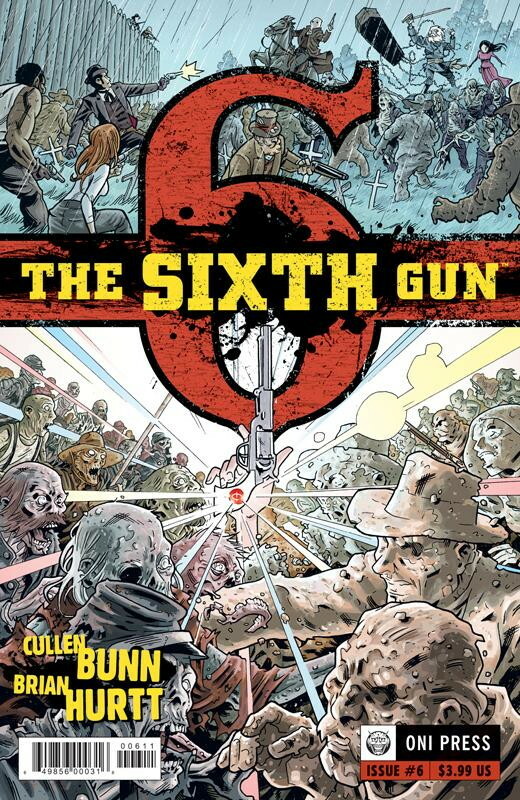 The other series that’s been a lot of fun is The Sixth Gun, which could easily have been a 6-issue miniseries, but apparently it’s continuing beyond this issue. Hooray! I’ve gushed about the series before, which involves supernatural guns in the Wild West, an insane Confederate General trying to bring about the apocalypse, and the handful of men (and the woman who inherits the General’s gun) trying to stop them. This issue has the big showdown with the General and his men, and it’s a good one, with some pretty awesome moments during the big battle. I don’t think it’s a surprise (since the series continues on) that the good guys prevail, although certainly there’s room for the General to return. I’m curious to see where Bunn & Hurtt take the series next, after this climax. I could see them jumping the story forward in time, or they might continue the current narrative – if the latter, I hope they start to focus a little more on the characters since they should have more time to let them grow a bit. Despite all the books below, the two best reads I picked up this week were from the back catalog: Ed Brubaker’s Captain America: Road to Reborn TPB, which is something of an intermission in the series but is the latest collection available. Have I gushed about Brubaker’s Captain America already? Really excellent stuff, being more adventure in the pulp/suspense tradition using mainstream Marvel characters than straight-super superheroics. Basically unlike anything else Marvel is publishing today. And then there’s Bryan Talbot’s Grandville HC, which on the one hand is an anthropomorphic graphic novel in that the lead character is a badger who walks and acts like a man and nearly every other character is also an animal, but on the other hand it’s a spy/intrigue story in an alternate world where France conquered the western world in the era of Napoleon, and in which Great Britain only recently won its independence. Talbot (correctly) ignores the peculiar inconsistencies that this could lead to in favor of telling a solid story with fine artwork (albeit slightly less detailed than his usual work). Unless anthropomorphic comics drive you up the wall and you just can’t get past that fact, I highly recommend it. The sequel is due out in a few months. Heh, I knew the current JSA storyline would involve time travel to set things straight. The time travel in question involves “only” sending a message back in time, and the suspense is that it’s not clear whether the message will be understood or received at the right time, but surely everything will work out for the best. The core setting of the story draws from many different elements: The superheroes being imprisoned and having to escape is very similar to the “Super-Stalag of Space” story featuring the Legion of Super-Heroes from Adventure Comics #343-344. The grim future where the heroes have been all but eliminated unless they can find a way to change one event in the past was the premise of Grant Morrison’s best JLA arc, “Rock of Ages”. And of course both of those elements form the seminal X-Men dystopian tale, “Days of Future Past”. So while this is a decent enough JSA yarn, it’s a far cry from being groundbreaking or original. I suspect there are a couple of issues left, so Willingham may yet surprise us, but it’s been pretty much what I expected otherwise. I guess the hardcover collections of Bob Layton’s great Hercules mini-series of the 1980s must have been well received, since this week we got the first chapter of a new installment in the run, Hercules: Death of a God. 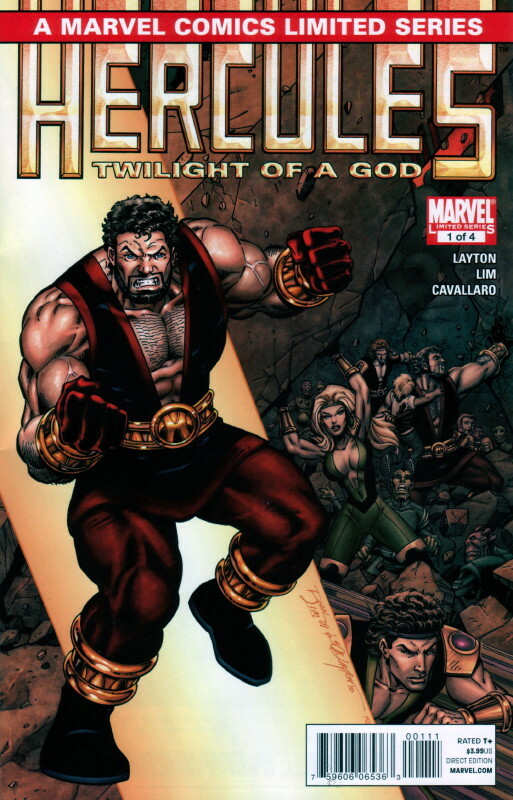 Taking place centuries in the future, as the first two did, Herc has a son who’s become a emperor of a galactic empire, a benevolent monarch educated by his father. Arimathes has several children of his own now, and is not immortal, unlike his father. However, at the beginning of the issue Hercules suffers a traumatic brain injury, one so severe that the empire’s doctors fear that another serious blow could kill him. He takes medication for his condition, but it interacts badly with his drinking. And Herc’s longtime companions are nearing their own ends, as Skyppi the Skrull is quite old, while the Recorder appears to be wearing down. All of this is set against the backdrop of people scheming to their own ends within the empire. The series has (in my mind) a huge legacy to live up to, Layton’s originals being well-drawn and often-hilarious comics with plenty of heart. This first issue is a little disappointing, as it seems like Herc is limping off into the darkness rather than going out like a lion. Of course, it would be in keeping with the tone of the series for him to face one last big threat rather than going quietly. It would be even more in keeping for him to beat his condition entirely. Ron Lim does the pencilling under Layton’s inks, whereas Layton drew the whole thing himself in the earlier series. Lim seems to be Marvel’s go-to guy when a top tier artist can’t make their deadlines; he’s reliable, but not very flashy, having a rather generic style. So overall the series doesn’t quite look as good, but it’s okay. So the first issue is something of a mixed bag, whereas I’d been hoping it would knock my socks off. But, it still might.